The definitive version Batman returns on Blu-ray with Batman Begins and stars Christian Bale as the tortured soul of Batman as Bruce Wayne, Billionaire by day and masked vigilante at night. Although the Michael Keaton version of Batman was met well with the viewing audience, the follow-up movies that starred Val Kilmer and George Clooney were met with mixed criticism. Fortunately, Director Christopher Nolan re-launched the series from the beginning that was based on the script by David Goyer, a former comic writer who had a great grasp over the character. From there it was almost as it was meant to be as it followed Bruce Wayne through his journey to ultimating becoming the Batman. Paying homage to the original comic, this version of Batman was considerably darker than previous incarnations and the film contained a star studded cast that include Michael Caine as Bruce Wayne's Butler Alfred, Cillian Murphy as Dr. Jonathan Crane (The Scarecrow) and Liam Neeson, a mysterious individual with a dark and secretive background. We learn that on the night Bruce Wayne's billionaire parents were killed, he has become a tortured soul that led him around the world, searching and struggling to accept this heinous incident. Walking down the dark path of criminals in order to understand, he eventually gets caught and is incarcerated in Asia, only to be taken under the wing of a mysterious martial artist where he learns how to strike fear into those who prey on the innocent and the weak. As Bruce Wayne has been gone for a considerable amount of time, he has been declared dead by Wayne Enterprises CEO Earle (Rutger Hauer) who is forcing the company into unscrupulous deals and to compound the situation for the denizens of Gotham City, Dr. Crane who is working for the mobster Carmine Falkone (Tom Wilkinson) and also a mysterious foreigner is attempting to poison the water supply of this town. Returning to Gotham City, Wayne is shocked to see the fall of Gotham an through the assistance of Alfred and Lucius Fox (Morgan Freeman), a scientist for Wayne Enterprises, he eventually takes the guise of Batman in this entertaining action movie that truly set the benchmark for comic book movies. The best aspect of Batman Begins is that it can be watched over and over again due to the talents of the actors and the almost perfect script. The video quality of the Blu-Ray version of Batman Begins is quite impressive and is exceptionally clear with extraordinary picture quality and vibrant colours. The night scenes during the end contain some great black levels and look great on our Plasma TV. As with the video quality, the audio quality is brilliant and is presented in Dolby TrueHD 5.1 that sounds majestic through our surround sound system. A true movie-like experience from star to finish. Where the disc or discs do shine is through the special features that include a six-minute prologue of the The Dark Knight that was filmed on IMAX which looks amazing and also introduces the next aspect of the series. Match that with some great featurettes and also a 16-page DC Comic book adaptation of the upcoming movie and you have everything you need for an in-depth insight into one of the world's greatest fictional super heroes. 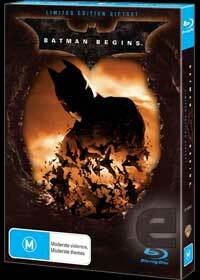 In conclusion, this is the ultimate Batman experience and is a must have for all blu-ray owners! Exclusive The Dark Knight Prologue - shot in IMAX, see the first six minutes of the film in the highest resolution ever!